Typically this time of year, the vast expanse of the Allegheny Mountains transforms into a breathtaking vista of amber, burnt orange, and crimson and this autumn is no exception. The crisp air and dropping mercury, signals the start of winter preparations around our mini-homestead. We are breeding our four Nubian diary goats for the first time and will be spending a fair amount of time and energy putting together preps for tending to pregnant does and over-wintering in general. We will start our pre-winter overhaul in the goat yard. 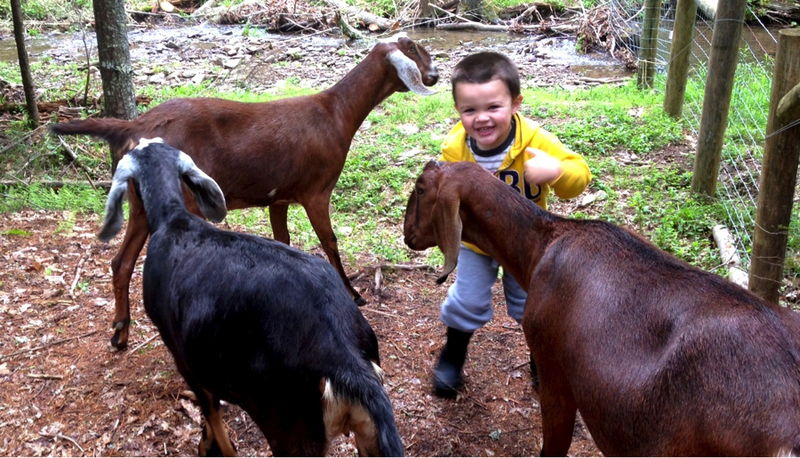 Currently our goats are being boarded with another family member’s herd of Boer goats. While this has worked well, we have decided to separate our smaller herd so we can better control their health and feeding. For winter, we are going to build a small lot, approximately 100 x 30 feet, adjacent to our house that we will expand on in the spring. Currently our goats reside in a three-sided lean-to, which has been adequate. However, in anticipation of kidding we thought everyone would prefer a more sustainable shelter. Hence the plans for a 20 x 10 mini-barn with room for hay and grain storage, a milking stanchion and a few kidding pins. I think I am most excited about this, since it will provide a warm location for those five am milkings in the early spring when Mother Nature can still be quiet brutal. This new mini-barn will also provide some benefits to the goats. They will have yard access and a draft-free, well-lighted, and well-ventilated shelter. We are going with a good-old dirt floor that we will cover with straw and wood shavings. Most likely we will continue to use a deep bedding technique over the winter, which as fresh layers are added, gives the benefit of extra heat from the composting bedding underneath. We are going with a modest sized barn, which should give us the space we need, while keeping the barn small enough for the goats to keep heated. Another change that we are making this winter is an improved feeding program. This is not only in anticipation for breeding, but a move to improve the overall health of the herd. Our new mini-barn will provide enough space to create four feeding stations allowing us to control exactly what each goat receives. The goats will be given free choice to quality (Alafia) hay and salt, mineral blend, and sodium bicarbonate. They will also receive a cup of grain, a small scoop of black oil sunflower seeds and herbal wormer (per the directions). They will have access to plenty of warm water with a splash of raw apple cider vinegar that we are fermenting ourselves from the apples scrapes left over during our endless apple-preserving endeavor. And of course, they can browse from the woody landscape to their little hearts’ content. Finally, since our ladies are of breeding age, we think that it’s important to get the goats tested for a variety of possible aliments. We have a vet appointment scheduled for early October and will have a routine health examine and blood work completed to screen for Caprine Arthritis and Encephalitis (CAE), Tuberculosis (TB), Johne’s, Brucellosis and Caseous Lymphoma (CL). It seems like summer flew by and we still have so much to-do to prepare. As the weeks creep closer and closer to that first snowfall, we are working to purchase and store as much bedding, feed and supplements, and general supplies as possible so that we are prepared and ready for winter. It’s a busy, but very exciting time. Goat Health & Husbandry. FiasCoFarm.com.